The Chicago Blue Dolphins Swim Team is a year-round swimming club designed to help the kids develop great swim strokes, build fitness and racing skills, and become a great teammate and a strong young person. 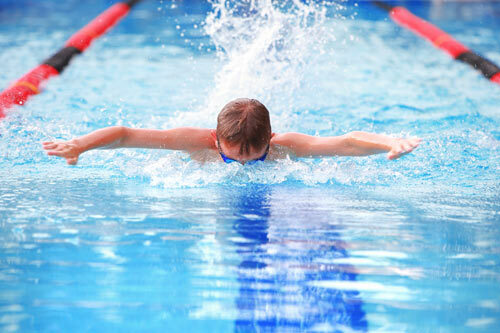 Our swim team offers a safe, positive and productive environment for kids of all abilities ages 12 and under. Regardless of a swimmer’s current skill level, we encourage our athletes to live and train with vigor. What Do the Swim Team Members Learn? How to Practice with Purpose—There’s nothing more frustrating as a parent (or a swimmer) than seeing a lot of “swimming back and forth” where your child is making the same mistake over and over again. Our practices are designed to push the limits of our swimmers but with the ultimate purpose of training the right strokes and habits for race day. How to Build Great Practice Habits and Racing Skills—Swimmers who stay in the sport and succeed in the long term do so because they have great practice habits. We teach our kids how to practice well by understanding the goals of the sets and teaching them to recognize whether they are achieving those goals (e.g., time, stroke counts, tempos, etc.) We also work with the kids to learn racing skills like starts, turns and streamlines, so they nail them on race day. How to Be a Great Teammate—The best memories of competitive swimming are usually about the people you meet on the team. While we want to create an environment where each individual child is successful, we also want to teach our kids how to be a positive member of a team and community. We encourage a spirit of shared goals, mutual support and respect. Our swimmers take those lessons from the pool back to school and into the rest of their lives. When and where are the Swim Team practices held? Swim team practices will resume on Tuesday November 6, 2018. What are the Prerequisites for Joining the Team? Because we incorporate all four strokes into our practices, your kiddo needs to have a solid foundation of the competitive swim strokes. We want our swimmers to have completed our Intermediate 2 class before joining the team. 50 yards of freestyle with the ability to breathe in the rhythm of the stroke with good body rotation. 50 yards of backstroke with a straight arm recovery and body roll. 25 yards of breaststroke with basic pull-breathe-kick-glide technique. 15 yards of butterfly with at least 1 rhythmic breath with arms clearing the water, landing in unison and no flutter kick. If you feel your child can meet these requirements, call the office at 773-342-7250 and schedule a time to stop by a swim practice. One of our coaches will do a quick assessment with your child. If your child cannot swim these requirements, consider one of our Kids Learn-to-Swim Classes or private lessons. If you select one practice per week, you’ll also need to tell us which day of the week that your child will be swimming. In addition to tuition, there is a $20 annual membership fee to cover insurance and safety costs. If you continue on with us beyond one year (and we hope you do), you’ll be charged the membership fee on each anniversary. When you register for our Kids Swim Team, we charge your credit card that day for the first month. If you register before the 15th, we will charge you for the full month; registrations after the 15th will be at 50% of the regular monthly costs. We will then set you up for automatic payment to run on the 1st of the month for the subsequent months. We will keep you on auto pay until you notify us in writing that you are planning on leaving the program. You must let us know before the last month of the month that plan to discontinue your membership. We will not offer refunds after the monthly automatic payment cycle has run. Whether you’re a returning member or new member joining our team, the registration process is simple and takes only a few minutes. You will be requested to provide payment information during the last step of the registration process. At the conclusion of the registration process and upon team admin approval, you will be granted access to your own private account for the team. Your private account is your one-stop-shop for maintaining your contact information and for gaining access to information about our team. This account will help you with declaring for swim meets, signing up for jobs, interactively tracking your kids times, and much more. We look forward to having you be part of our incredible swim program. Just click this link or the image above and you be brought directly to the registration page on our team’s website. If you would like to schedule a trial workout to see if the location, times, and practice content are a good fit for you, please fill out the form and our office will contact you. If you would like to talk to a friendly voice directly, you can call our office at 773-342-7250.